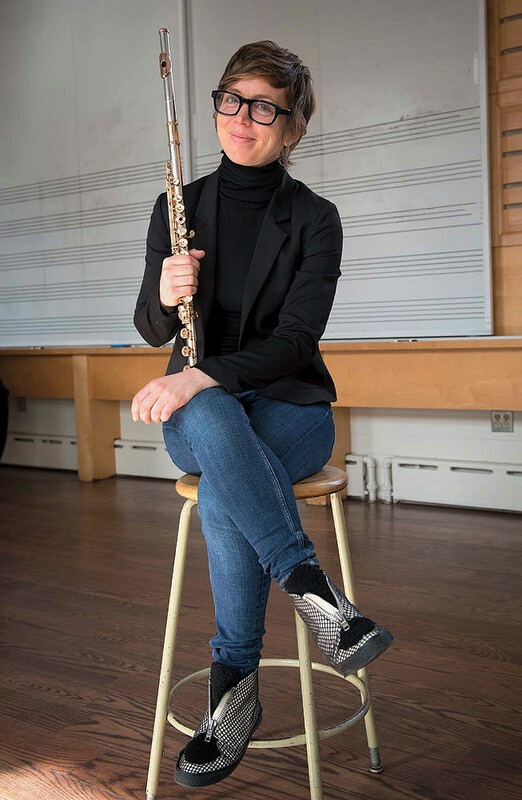 During her first week of teaching at Harvard, the flutist Claire Chase was arrested while blocking traffic on Massachusetts Avenue—part of a protest  last September prompted by the Trump administration’s announcement that it would end the Deferred Action for Childhood Arrivals (DACA) program. The demonstration was organized by and mostly comprised faculty members from the history department; having a new professor of the practice of music in their midst might have seemed unusual. For Chase, it was anything but. A commitment to rethinking the social role of the artist is at the core of her creative work. Chase is among the most important figures working in classical music today. Her eclectic repertoire, centered upon music of the present and very recent past, augments the sonic possibilities of the flute through the use of extended techniques and electronics; she delights in works that require her to act, vocalize, and otherwise heighten the drama of a performance. In 2001, on a $500 budget, she launched the International Contemporary Ensemble  (ICE), which now stands at the zenith of the new-music scene—widely admired for its adventurousness and seemingly limitless aesthetic capacities. Its 35 members perform in various configurations, from intimate chamber groups to all-hands-on-deck endeavors, and have given more than 500 premieres. Their performances, which often feature multimedia and electro-acoustic compositions, have a vividly theatrical feel. The group is committed to a collective, artist-led structure in which many musicians also take on staff roles, and all ensemble members have a say in administrative and programmatic decisions. This idea is perhaps more easily experienced than explained. On a chilly evening in early spring, the organizers of the September protest held a concert in Memorial Church. Part of the DACA Seminar , an event series convened to educate the University community about U.S. immigration policy, the concert was intended as a celebration of solidarity after a day of workshops and talks. Chase’s contribution included a brief live performance, followed by a 2016 composition by Iyer called Flute Goals: Five Empty Chambers. The piece upended the expectation that the soloist is the primary focus of a solo performance. In a subtly symbolic inversion of the composer-performer relationship, Iyer created the piece using an array of improvised sounds that Chase prerecorded on five flutes. Uncanny and riveting, these sounds careened, collided, and whirled with propulsive energy. Chase introduced the piece from the stage, but as the recording played, she went to join Iyer in a pew. Most people listened quietly, while a few children chattered, and conversations floated in from the entryway; everything became part of the sonic mix. This was music that noisily forged togetherness.